The Archdiocese has had sixteen Archbishops over the course of its history. Researchers are currently able to access the papers of the first archbishop, John Carroll (d. 1815), through the eleventh archbishop, Francis P. Keough (d. 1961). The papers of Cardinal Lawrence J. Shehan (d. 1984), Abp. W. Donald Borders (d. 2010), Cardinal William H. Keeler (d. 2017), and Cardinal Edwin F. O’Brien (resigned 2012) are closed. Biographies of the Archbishops are available on the website for the Archdiocese of Baltimore. The correspondence of Abps. Carroll, Neale, Maréchal, Whitfield, Eccleston, Kenrick, Spalding, Bayley, Gibbons, and Curley has been arranged alphabetically by correspondent. Every document has been assigned a unique number and has a corresponding index card describing it. Researchers are able to access these collections through the existing card catalog system. A strictly chronological index is available only for the papers of Cardinal James Gibbons (d. 1921). The Abp. Francis P. Keough Papers were opened in 2014 and arranged by record series. Researchers are able to access the collection through a finding aid. The papers of Archbishops Carroll, Neale, Maréchal, Whitfield, Eccleston, Kenrick, Spalding, and Bayley have been microfilmed. A set of the microfilm is available at both the Associated Archives and the University of Notre Dame. Abp. John Carroll Papers (Born: 1735, Upper Marlboro, MD; Prefect Apostolic of the U.S., 1785-1789; Bishop of Baltimore, 1789-1808; Archbishop of Baltimore, 1808-1815; Died: 1815, Baltimore, MD). Size: 11 document cases and 3 letterbooks; available on microfilm; date range: c. 1750-1815.
Letters to Abp. Carroll, 1786-1815. 7 document cases. Incoming correspondence. Letters from Abp. Carroll, 1786-1815. 1.5 document cases. Some of these letters are rough drafts, others originals apparently returned to the archives. Administration of Abp. Carroll, 1750-1815. 2 document cases. Contains both incoming and outgoing correspondence, although mostly the former, and pertains more directly to Carroll’s administration of the archdiocese. Also included in this series is the account book Carroll maintained regarding Bohemia Plantation, 1790-1815, decrees of the first Diocesan Synod (1791), and Carroll’s copy of the Roman Ritual (1775). Letterbooks of Abp. Carroll, 1799-1815, 3 vols. Copies of outgoing letters. Arranged chronologically; index of names. Vol. 1, 1784-1792; vol. 2, 1792-1799; and vol. 3, 1799-1815. See also Archbishops – General, Special A and B Collections for additional materials relating to the administration of Abp. Carroll. Abp. Leonard Neale, S.J., Papers (Born: 1746, Port Tobacco, MD; Died: 1817, Washington, D.C.; Coadjutor Bishop of Baltimore, 1800-1815; Archbishop of Baltimore, 1815-1817). Size: 1 document case and 1 letterbook; available on microfilm; date range: c. 1792-1817. Administration of Abp. Neale, 1792-1817 [bulk dates, 1816-1817]. 1 document case. Incoming and outgoing correspondence of Neale as priest, bishop, and second Archbishop of Baltimore. Letterbook of Abp. Neale and Abp. Maréchal, 1814-1827, 1 vol. .5 document case. Contains copies of Neale’s incoming and outgoing letters for the period 1816-1817 together with official copies of supporting documents ranging in date from 1814-1817. Arranged chronologically; no index. See also Archbishops – General, Special A and B Collections for additional materials relating to the administration of Abp. Neale. Abp. Ambrose Maréchal, P.S.S., Papers (Born: 1768, Ingres, France; Archbishop of Baltimore, 1817-1828; Died: 1828, Baltimore, MD). Size: 9 document cases, 2 pamphlet boxes, and 1 letterbook; available on microfilm; date range: c. 1803-1827.
Letters to Abp. Maréchal, 1803-1827, 5.5 document cases. Incoming correspondence. Administration of Abp. Maréchal, 1783-1827. 5.5 document cases and 2 pamphlet boxes. Correspondence and personal papers, including a collection of sermons and pastorals, a diary maintained for the years 1818-1825, a photocopy of Maréchal’s 1819 Letter addressed to the Catholics of Norfolk, VA, and account books. Letterbook of Abp. Neale and Abp. Maréchal, 1814-1827, 1 vol. Contains copies of Maréchal’s incoming and outgoing letters for the period, 1817-1826 together with official copies of supporting documents ranging in date from 1814-1827. Arranged chronologically; no index. See also Archbishops – General, Special A, B, and C Collections for additional materials relating to the administration of Abp. Maréchal. Abp. James Whitfield Papers. (Born: 1770, Liverpool, England; Archbishop of Baltimore, 1828-1834; Died: 1834, Baltimore, MD). Size: 1.5 document cases and 1 letterbook; available on microfilm; date range: c. 1807-1834. Administration of Abp. Whitfield, 1807-1834. 1 document case. Correspondence and personal papers of Whitfield’s as priest and fourth Archbishop of Baltimore. Letters from Abp. Whitfield, 1828-1834. .5 document case. Photocopies of letters from Whitfield found in other archives, including Abp. Rosati of St. Louis. Letterbook of Abp. Whitfield, 1828-1832, 1 vol. Copies of Whitfield’s letters with Roman officials on various subjects. See also Archbishops – General, Special A and B Collections for additional materials relating to the administration of Abp. Whitfield. Abp. Samuel Eccleston, P.S.S., Papers (Born: 1801, Chestertown, MD; Archbishop of Baltimore, 1834-1851; Died: 1851, Washington, D.C.). Size: 4.5 document cases; partially available on microfilm; date range: c. 1822-1851.
Letters to Abp. Eccleston, 1822-1851. 1.5 document cases. Incoming correspondence. Administration of Abp. Eccleston, 1824-1851. 1.5 document cases. Correspondence and personal papers, including a collection of Eccleston’s sermons, miscellaneous loose pages from a diary, notes, and manuscript copies of acta for Provincial Councils 6 (1846) and 7 (1849) and Archdiocesan Synod 2 (1831). There are also photocopies of letters to and from Eccleston found in other archives, including Abp. Rosati of St. Louis. The sermon collection and miscellaneous loose pages from a diary and notes were a gift of the Mount de Chantal Visitation Monastery Archives, Wheeling, WV, in 2002. Visitation Monasteries of Baltimore, Georgetown, and Wheeling, 1824-1851, 1 document case. Correspondence from Abp. Eccleston to the Baltimore Visitation Monastery, as well correspondence between the Baltimore, Georgetown, and Wheeling monasteries regarding Abp. Eccleston’s final days. Gift of the Mount de Chantal Visitation Monastery Archives, Wheeling, WV, in 2009. See also Archbishops – General, Special A, B, and C Collections for additional materials relating to the administration of Abp. Eccleston. Abp. Francis P. Kenrick Papers (Born: 1797, Dublin, Ireland; Coadjutor Bishop of Philadelphia, 1830-1842; Bishop of Philadelphia, 1842-1851; Archbishop of Baltimore, 1851-1863; Died: 1863, Baltimore, MD). Size: 3 document cases, 1 diary, 1 letterbook, and 1 account book; available on microfilm; date range: c. 1811-1863.
Letters to Abp. Kenrick, 1811-1863. 2 document cases. Incoming correspondence. Letters to and from Abp. Kenrick, 1815-1863. .5 document case. Mostly incoming correspondence with a number of outgoing letters that were apparently returned to the archives. Administration of Abp. Kenrick, 1823-1863. 1 document case. Papers relating to various subjects, including the First Plenary Council of Baltimore (1852), Provincial Councils 8 (1855) and 9 (1858), and Archdiocesan Synods 3 (1853), 4 (1857), and 5 (1863), the American College in Rome, as well as copies of letters from the Congregation of the Propaganda Fide to Kenrick, 1823–1851. Episcopal diary, 1851-1863, 1 vol. ; letterbook, 1851-1862, 1 vol. ; and book of accounts, 1 vol., 1831-1851. Letter Register of Abp. Kenrick and Abp. Spalding, 1862–1869, 1 vol. This volume is mostly for Spalding and is in greater part a mere register of incoming letters. Arranged chronologically; index of names. See also Archbishops – General, Special A and B Collections for additional materials relating to the administration of Abp. Kenrick. Abp. Martin J. Spalding Papers (Born: 1810, Rolling Fork, KY; Auxiliary Bishop of Louisville, 1848-1850; Bishop of Louisville, 1850-1864; Archbishop of Baltimore, 1864-1872; Died: 1872, Baltimore, MD). Size: 6 document cases, 2 letterbooks, 1 letter register, and 1 photograph album; available on microfilm; date range: c. 1831-1872.
Letters to and from Abp. Spalding, 1831-1872. 3 document cases. Personal and official correspondence of Spalding’s as priest, Auxiliary Bishop, Bishop of Louisville, and seventh Archbishop of Baltimore with some wide gaps, including a series of family letters as well as the letters written by Spalding while Bishop of Louisville to Abp. Kenrick of Baltimore. Administration of Abp. Spalding, 1831-1871. 3 document cases. Both official and personal papers on a wide variety of subjects that span Spalding’s priestly career, including the Second Plenary Council, First Vatican Council, American College in Rome, Ninth Provincial Council of Baltimore, as well as Spalding’s Episcopal diary, 1864-1871, miscellaneous newspaper clippings, and some letters from Spalding, mostly to members of his family during his student days in Rome dating from 1830. Letterbook of Abp. Spalding, 1865-1869, 1 vol. Official copies of outgoing letters preceded by an index of names. Arranged chronologically. Letterbook of Abp. Spalding and Abp. Gibbons, 1870-1886, 1 vol. Official copies of Spalding’s outgoing letters for the years 1870-1871. Arranged chronologically; no index. Letter Register of Abp. Kenrick and Abp. Spalding, 1862-1869, 1 vol. This volume is mostly for Spalding and is in greater part a mere register. Arranged chronologically; index of names. Acta Episcopalia (Episcopal Diary), Louisville, 1860-1864. Also contains a short account of several Catholic institutions in Louisville together with a register of Spalding’s diocesan correspondence and correspondence with the Society for the Propagation of the Faith, 1860-1864. Acta Episcopalia (Episcopal Diary), Baltimore, 1864-1871. English translation available. Commemorative Photograph Album of the First Vatican Council ,1869, 1 vol. This album was acquired by Abp. Spalding while attending the First Vatican Council and is comprised of portraits of individual bishops who attended the council. See also Archbishops – General, Special A and B Collections for additional materials relating to the administration of Abp. Spalding. Abp. James Roosevelt Bayley Papers (Born: 1814, Harlem, NY; Bishop of Newark, 1853-1872; Archbishop of Baltimore, 1872-1877; Died: 1877, Newark, NJ). Size: 4.5 document cases; available on microfilm; date range: c. 1856-1877.
Letters to and from Abp. Bayley, 1856-1877. 3 document cases. Incoming and outgoing correspondence, both official and personal, of Bayley’s as Bishop of Newark and eighth Archbishop of Baltimore. Administration of Abp. Bayley, 1823-1877. 1.5 document cases. Both official and personal papers on a wide variety of subjects that span much of Bayley’s priestly career, including Roman documents, family letters, 1 Episcopal diary for the years 1872-1876, and three personal diaries he maintained over the period 1842-1867. See also Archbishops – General, Special A and B Collections for additional materials relating to the administration of Abp. Bayley. Card. Abp. James Gibbons Papers (Born: 1834, Baltimore, MD; Vicar Apostolic of North Carolina, 1868-1872; Bishop of Richmond, 1872-1877; Archbishop of Baltimore, 1877-1886; Cardinal Archbishop of Baltimore, 1886-1921; Died: 1921, Baltimore, MD). Size: 56.5 document cases and 1 letterbook; date range: c. 1861-1921.
Letters to and from Abp. Gibbons, 1861–1921. 42.5 document cases. Primarily incoming correspondence, official and personal, with some copies of outgoing correspondence of Gibbons’ as priest, Vicar Apostolic of North Carolina, Bishop of Richmond, and ninth Archbishop of Baltimore. Legal size documents have been separated out and stored separately. Administration of Abp. Gibbons, 1861-1921. 14 document cases. Correspondence, official and personal papers that span much of Gibbons’ priestly career, including 2 Episcopal diaries 1868-1917 (typed transcript available) and 1878; letters from members of Europe’s Royal Families, c. 1887-1916; letters to and from U.S. Government Officials, c. 1918-1921; a collection of Gibbons’ sermons; genealogical material regarding the Gibbons family; newspaper clippings, scrapbooks, commemorative publications, and miscellaneous books. Letterbook of Abp. Spalding and Card. Gibbons, 1870-1886, 1 vol. Official copies of Gibbons’ outgoing letters, 1884-1886. Arranged chronologically; no index. See also Archbishops – General, Special A, B, and C Collections for additional materials relating to the administration of Card. Gibbons. Abp. Michael J. Curley Papers (Born: 1879, Athlone, Ireland; Bishop of St. Augustine, 1914-1921; Archbishop of Baltimore, 1921-1939; Archbishop of Baltimore and Washington, D.C., 1939-1947; Died: 1947, Baltimore, MD). Size: 56 document cases; date range: c. 1905-1947. Administrative Papers of Abp. Curley, 1921-1947. 46 document cases. Contains official and personal incoming and outgoing correspondence, Curley’s Episcopal Diary, 1921-1947, 2 vols., as well as a collection of Curley’s sermons and addresses, and material regarding jubilee celebrations and Curley’s death. Roman Documents of Abp. Curley, 1921-1947. 3 document cases. Incoming and outgoing correspondence between Curley and Roman officials. Apostolic Delegation Letters, 1905-1947, 3 document cases; no finding aid available. Contains the incoming and outgoing correspondence between Cardinal Gibbons, Abp. Curley, and Msgr. Joseph Nelligan (Chancellor of the Archdiocese) with the U.S. Apostolic Delegation largely concerning the building of a new residence for the Apostolic Delegate in Washington, D.C..
Uncatalogued papers of Abp. Curley. 2 document cases. See also Archbishops – General, Special A, B, and C Collections for additional materials relating to the administration of Abp. Curley. Abp. 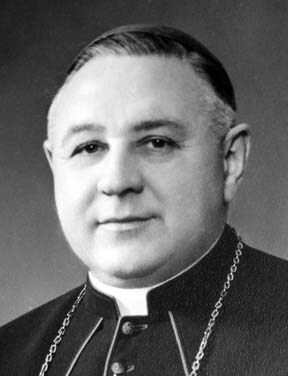 Francis P. Keough Papers (Born: 1889, New Britain, Connecticut; Bishop of Providence, 1934-1947; Archbishop of Baltimore, 1948-1961; Died: 1961, Baltimore, MD.) Size: 14 record storage boxes; 5 document cases; 2 pamphlet boxes; date range: c. 1948-1961. Administrative Papers of Abp. Keough, 1948-1961. 9 record storage boxes. Contains official and personal incoming and outgoing correspondence, consultor minutes, as well as a collection of sermons and addresses and material regarding jubilee celebrations and his death. Catholic Charities Collection, 1948-1961. 1 record storage box, 1 document case. Contains incoming and outgoing correspondence as well as fund appeals and financial statements. Cathedral of Mary Our Queen Collection, 1954-1961. 2 record storage boxes, 1 flat storage box. Contains incoming and outgoing construction correspondence as well as inspection and account reports. Catholic University of America Collection, 1 record storage box, 1 document case. Contains incoming and outgoing correspondence as well as committee minutes and reports relating to his tenure on the Board of Trustees. National Catholic Welfare Conference, 1948-1960. 3 record storage boxes, 2 document cases. Contains incoming and outgoing correspondence and material relating to his assignments, which included serving as chair of the administrative board, education, legal, and social action departments. Archbishops – General. Size: 7 document cases, 4-.5 document cases, and 12 volumes; date range: c. 1783-1959. Special A and C Collections – Significant Individuals. Size: 2-.5 document cases; typed finding aid; available on microfilm; date range: c. 1784-1947. Contains letters addressed to the Archbishops of Baltimore concerning matters deemed confidential or significant. Included are letters from noted clergy, U.S. political leaders, and international leaders of the Catholic Church. Special B Collection – Propaganda Fide Letters and Roman Documents. Size: 4 document cases, 4-.5 documents cases, and 1 bound volume; typed finding aid and index card file; partially available on microfilm; date range: c. 1783-1961. Correspondence from the Congregation of the Propaganda Fide in Rome to the Archbishops of Baltimore, c. 1784-1877, and a copybook of incoming documents and letters from various Roman Congregations to the Archbishops of Baltimore, c. 1783-1863. Special D Collection – U.S. Presidents. Size: 1.5 document cases; typed finding aid; partially available on microfilm; date range: c. 1790-1961. Contains letters addressed to the Archbishops of Baltimore from Presidents of the United States. Synods and Councils of the Archdiocese of Baltimore Collection. Size: 2 document cases; typed finding aid; available on microfilm; date range: 1791-1884. Contains files pertaining to the three plenary and ten provincial councils and nine synods held in Baltimore over the course of the nineteenth century. Scrapbooks of the Archbishops of Baltimore Collection. Size: 10 volumes; date range: 1892-1959. Contains a collection of the scrapbooks either presented to or created by the Archbishops of Baltimore, including ones for the Columbian Catholic Congress of 1892, Tercentenary Anniversary of the Founding of Maryland, 1934, erection of Archdiocese of Washington, D.C., in 1939, the dedication of the Cathedral of Mary Our Queen in 1959, and miscellaneous jubilee celebrations. Register of seminarians ordained for the Archdiocese of Baltimore. Size: 1 vol. ; arranged chronologically; no index; date range: 1830-1921. Deeds Collection. Size: 1 document case; typed finding aid; available on microfilm date range: 1801-1891. Contains miscellaneous deeds that were found in the Archbishops’ papers. Last Wills and Testaments Collection. Size: 1 document case; typed finding aid; available on microfilm; date range: 1787-1919. Contains authentic copies of miscellaneous last wills and testaments that were found in the Archbishops’ papers for priests that have served in the archdiocese, as well as for a number of U.S. bishops, including, Abp. John Hughes of New York and Bp. Richard V. Whelan of Wheeling. U.S. Bishops’ Pastorals Collection. Size: 1 document case; no finding aid; date range: 1833-1897. Contains copies of miscellaneous pastorals issued by U.S. Bishops over the course of the nineteenth century, including Baltimore, Cincinnati, and New York.